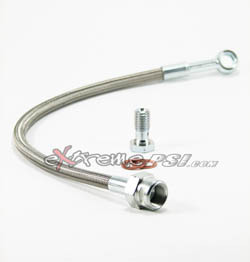 Braided stainless steel turbo oil feed line for Subaru STI / WRX with AVCS. It comes with 10mm banjo fitting for the turbocharger. It also includes crush washers and banjo bolts for complete installation of factory threaded turbochargers.